Good news, everyone! Today, we’re introducing a faster, easier way to publish your audiobooks on ACX. With the new Direct Offer feature, authors and publishers can now choose to work directly with their favorite Producers and narrators without opening their titles to accept auditions. We’ve heard from many Rights Holders that they’ve found “the one” —that perfect voice—either through past projects or by browsing samples on the ACX site, and would like to move their audiobook projects directly into production, and today’s changes are meant to help make that even easier. To make a Direct Offer to a Producer, navigate to your title from your Project Dashboard, or add a new project to your account. As you set up your title, you’ll have the option to accept auditions for your project or make a Direct Offer to the Producer of your choice. Selecting the option to make a Direct Offer will allow you to select your Producer by searching for his or her name, or selecting from a list of Producers that you’ve collaborated with in the past. You’ll then be able to make an offer directly to your Producer of choice and start collaborating as soon as your offer is accepted. Want tips for selecting that perfect voice? The ACX Blog has you covered. What other features would you like to see added to ACX? Comment with your suggestions below. ☐ Record in a quiet, non-reverberant room to minimize background noise. ☐ Make sure there’s enough distance between your voice and the microphone to prevent pops, loud breaths, and unwanted vocal artifacts. ☐ Use a dynamic microphone as opposed to a condenser when recording in a noisy environment. Some popular mic choices in this category include the Electro Voice RE20 and the Shure SM7B. ☐ Use a pop filter placed in front of the microphone to help tame plosives and sibilance. ☐ Learn and use the punch ‘n’ roll recording technique. Recording through an entire chapter in one take will often result in the file containing repeated lines, noises, and breaths that need to be edited out. ☐ Record and save 30–60 seconds of clean room tone to use when editing out noises. ☐ Utilize a QC sheet to identify and resolve any editing issues. Narration with excessive mouth noise and vocal artifacts. Clicks and pops located at the beginning of a file before the performance begins and at the end of a file after you’ve finished recording a chapter. Long gaps of audio silence within the middle of a file. ☐ No files exceed 120 minutes in length or 170 mb in size. ☐ All files must be recorded at a 44.1khkz sampling rate. ☐ All files must be 192 kbs or higher MP3s, encoded at a constant bit rate (CBR), not variable bit rate (VBR). ☐ All files within a given production must be either all stereo or all mono files. ☐ Record at the proper volume. Your voice should peak around -12dB to -8dB. Adjust your pre-amp so that your voice peaks at this level, then keep it at that level. Set it and forget it. ☐ If you need to adjust the level at which you’re hearing yourself while recording, adjust your monitor level, not your preamp. ☐ Use proper mic technique to ensure your performance is within the appropriate volume range. ☐ Check file level statistics within your DAW to ensure you are meeting the ACX requirements. Group like files together in larger books to make mastering easier. ☐ Use normalization and compression to even out your files. Don’t EQ after compression, as this could affect your final levels. ☐ Keep your monitor level consistent during mastering. ☐ Make sure you are editing with both fidelity to the manuscript and the listening experience in mind. ☐ During the edit/QC stage, keep room tone handy to use when structuring files. ☐ Leave one half second to 1 second of clean room tone at the beginning and between 1 and 5 seconds of clean room tone at the end of each file. ☐ Ensure that all of your audiobook project’s files have been uploaded to ACX only once each, and in the proper order. ☐ Make sure you’ve included the appropriate chapter/section headers at the start of each file. ☐ Record each section or chapter in a separate track in your project file within your DAW. ☐ Include the file order number along with the section name in your file name. This will help you keep track during upload. Example: 01_Tom Sawyer_Opening Credits.mp3, 02_Tom Sawyer_Acknowledgements.mp3, 03_Tom Sayer_Ch01.mp3, etc. Print this blog post out and use it as a checklist to ensure you hit all of our QA team’s recommendations. Following the QA team’s advice will put you on the right path to speeding your production to “on-sale,” and will help ensure a satisfied Rights Holder and happy listeners for your audiobook. 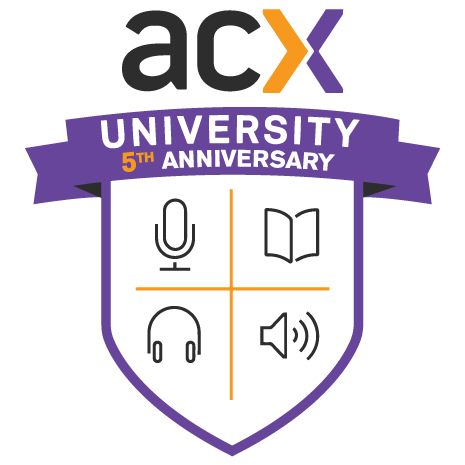 ACX is excited to welcome new voices and stories onto our revolutionary audiobook creation platform. Starting today, Canadian and Irish Rights Holders and Producers can list their audio samples and audiobook projects for auditions in the ACX marketplace. To date, authors, publishers, studios, and narrators in the US and UK have produced over 80,000 audiobooks using ACX, and we can’t wait to hear what audiobooks you make next. We’d especially like to thank you for the opportunity to help create audiobooks around the world and support the creative community. Are you looking for a Canadian or Irish voice? Listen to samples. Ready to show off your accents? Update your samples. Visit ACX.com to get started! Like to listen? Click on the player below to hear this post in audio. As an author, actor, and audiobook producer, Craig Tollifson brings a unique perspective to ACX. His publishing industry background has allowed him to make the most of the time he spends auditioning by putting his effort into the most promising titles. He joins us today to share his tips for picking the best Royalty Share projects. The first audiobook I narrated went on sale in early 2015. It sold 11 copies. Since then, I’ve narrated 19 other titles, learned a lot about narrating, and learned even more about choosing good Royalty Share projects. This month I’ll pass 10,000 total sales, and recently averaged over 1,500 sales a month. And those numbers just keep going up. Not bad for a beginner! I got my start on ACX as an author. I had my novella, The Junior Arsonists Club, produced as an audiobook by the talented Amy McFadden. I was interested in eventually narrating my own work, and had experience as a stage actor, so I decided to jump in and try it myself. Now I’m a full-time audiobook narrator and no one can say it’s weird that I sit in a giant box and talk to myself all day. Having been on the other side of the fence as an independent author has helped shape my choices as a narrator. I knew from the start I wanted to pursue Royalty Share projects. For years I’ve followed the indie publishing scene and noted a parade of successes, like Hugh Howey, Michael Bunker, and many more. The potential to earn more than a regular Per-Finished-Hour rate over the long term and gain passive income was very appealing. I also knew that I had to be smart in choosing the right projects. I had to get good at picking the books with the most potential for success. Genre makes a difference. Fiction accounts for nearly 80% of audiobooks sold, with mystery/thrillers and sci-fi/fantasy being near the top. Stick with popular genres if you want to sell. The Amazon sales rank can be very important for predicting success. This number represents sales per day compared to every other book in the Amazon store. Audiobook and eBook sales tend to rise and fall together. Remember, this is one product on two platforms. The lower the sales rank, the better! Without going into too much detail: a sales rank under one hundred is amazing. Run to the booth and start auditioning! A sales rank in the thousands is pretty great (remember there are over a million books in the Amazon store!). When you get over a hundred thousand, or two hundred thousand or more, well…that’s not so great. But remember: this rank is only a snapshot of one moment which represents that day’s trend. Message the Rights Holder on ACX to see how the book has been selling historically. Oftentimes, a great rank can be the result of a recent promotion, and when the promotion’s over it can completely sink again. Also, make sure the number you’re looking at is the paid rank. If the book is free, the rank loses a lot of its meaning and is not a good predictor of audiobook sales. The more reviews th e better, and the reviews should be mostly positive. Take some time and read some of those reviews. I recommend reading the most recent reviews, as early reviews are often solicited. Click through some of the reviewers themselves and check their profiles–if it’s the only book they’ve reviewed, it’s likely they are friends or family of the author and shouldn’t be considered. Reviews are also great for quickly getting a sense of the story, often more so than the author’s description, or first few pages of the book. Length of time on sale is a great metric when combined with the number of reviews and sales rank. A book that’s selling great, and has been on the market for, say, two years may have better potential than a book that’s only been out for two weeks with the same sales rank. Evaluate the rest of the author’s catalog–every last book–with the same criteria as the one up for production: sales rank, reviews, etc. If they have other audiobooks, even better. Ask the Rights Holder how many copies the other audiobooks have sold. Or, check to see how many ratings the other audiobooks have on Audible. More ratings mean more copies have been purchased. Now that you’ve done your research, you need to define success. Though you’re not working for a Per-Finished-Hour (PFH) rate when producing Royalty Share projects, you should still be thinking about how much you hope to earn. What is your time worth? Recording usually takes around 2 hours in the studio for every finished hour of audio. Then there’s editing, proofing, and mastering, which can add 3-4 hours (or more!) per finished hour of audio. You could easily be putting in 6 hours for every finished hour. With all that in mind, come up with your ideal PFH rate for the project. Multiply it by the length of the book in hours. Now, divide that total with a ballpark royalty and you’ll see how many copies you’ll need to sell to be satisfied that you’ve made a good decision. Do you really think the audiobook can sell that many copies? Does the Rights Holder? If you’re on the fence about a project, I find that thinking about earnings goals can help cement a decision. Once the book is produced and on the market, you and the Rights Holder both have a stake in its success. Before you jump into your next production, spend some time marketing. I spend time every week promoting titles via giveaways and soliciting reviews. 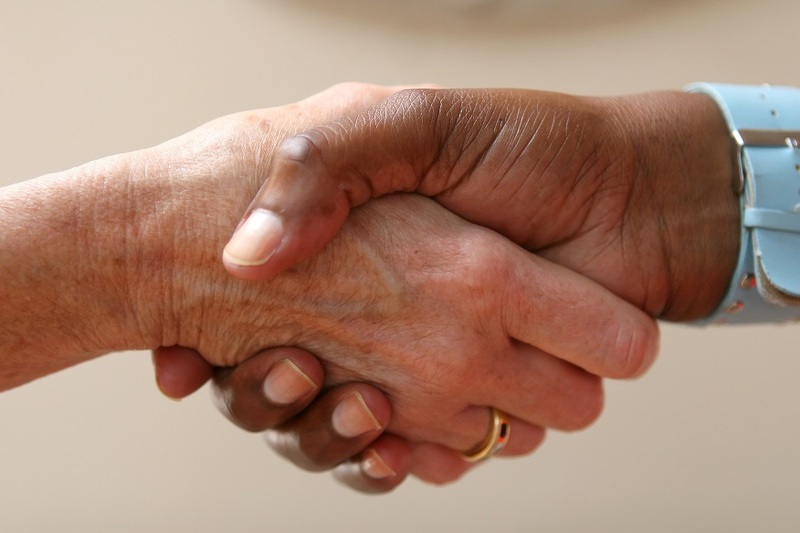 Social media can be a great resource if you find the right communities. There are a ton of places online that fans gather to discuss their favorite genre, like Goodreads, reddit, and many Facebook groups. Get yourself into those communities. You’ll meet fans and authors, both of which will help your audiobook career. The last thing you’ll need is a little bit of luck. All the points of research can add up to the best looking potential project on the planet, and you can do great promotion, but still…the audiobook may not sell well! Royalty Share comes with an element of risk. Your job is to find the ones with the best odds. I hope that the research tips I’ve given you today can help you choose the best bets for success. Craig Tollifson is the author of the Kindle Single the Junior Arsonists Club, the forthcoming novel Happy, and has written for Mystery Science Theater 3000. When he’s not writing or performing on stage, he narrates audiobooks under the name Andrew Tell. He lives with his wife and kids in sunny Los Angeles, California. At ACX, we know that audiobook production can be a complex process, so we’re always here to help. Today, we’re excited to share a new way to get answers to your questions: our new Help Center! Checklists for Rights Holders and Producers: Set yourself up for success with step-by-step instructions for starting and finishing your audiobook projects. Answer Ratings: Was this answer helpful? If not, tell us why. We’re listening to improve your experience. Plus, dozens of new answers to your most frequently asked questions! Visit the new Help Center today, and share your feedback with us. Get the latest on enhancements to ACX.com by subscribing to the blog! Have you searched for an audition-ready project on ACX recently? You may have noticed a new banner labeled “Offer Pending” in your results. And if you’ve seen this new feature, you might have a few questions about it. Lucky for you, we’ve got all the answers. Q: What does “Offer Pending” mean? A: “Offer Pending” means the rights holder of that title has made an offer to produce it to another ACX producer. Q: What if the offer was made to me? Will I still see the flag? A: Nope, but others will. Q: I’d really like to produce this book. How long does the other producer have to accept the offer? A: Depending on the offer, the producer who received it has from 24 – 72 hours to accept or decline the offer. Q: So can I still submit an audition even if a title has the “Offer Pending” banner? Q: Is that a good idea? A: That depends. Preparing, producing, and uploading an audition takes time. If the rights holder is negotiating with another producer, you might do that work only to find the book has gone into production. We suggest you message the rights holder to introduce yourself and request more information if you’re dead set on auditioning. Want to stay up to date on new ACX features? Subscribe to The ACX Blog! Who it’s between: A studio and a narrator, a producer and a narrator, a narrator and a fellow narrator. Why you may need it: You’re a studio or producer hiring a narrator, or you’re a narrator subcontracting another narrator to work on your multi-cast audiobook recording. What you get: A professionally narrated audiobook with up to four rounds of correction (aka “pickup”) sessions. Who it’s between: A narrator and an engineer, a narrator and a studio, or a studio and a freelance engineer. Why you may need it: You’re a narrator without a home studio, or a studio owner working with a freelance engineer. What you get: A professional engineer to record your (or your narrator’s) performance and provide you with the raw recorded files ready to be edited and mastered. Who it’s between: A narrator, producer, or studio, and an audiobook editor. Why you may need it: You’re a narrator or producer on a tight schedule, or you have a number of productions to complete back to back. Perhaps you prefer to focus on performing rather than audio editing. What you get: Professionally edited and QC’d audiobook files, ready for mixing and mastering. Who it’s between: A narrator, producer, or studio, and a post-production engineer. Why you may need it: You’re on a tight schedule, or you have a number of productions to complete back to back. You’ve decided to focus on performing rather than mastering your audio. What you get: A professional mix and master of your audiobook files, delivered ready for upload to ACX according to our Audio Submission Requirements. Armed with one or more of our independent contractor agreements, you can do your best work and rest assured that your collaborators are keeping up their end of the deal. Be sure to download and use them the next time you need to outsource an aspect of your ACX production. Have you outsourced the editing, mastering, or post-production of your audiobooks? Tell us in the comments below. You asked, we listened. Actors and authors using the ACX search may have noticed a new look and some new features this week. Here’s what’s new, what’s cool, and how to make the most of the enhanced ACX search. What’s Cool: Rights Holders and Producers can now choose multiple attributes when searching for their next voice or project. For example, Producers have the ability to see all books needing a New York or Boston accent simultaneously. Rights Holders can find a flirtatious cowboy for their latest romantic comedy or search for a voice that’s both upbeat and authoritative. How to Make the Most of It: Start clicking! When using either the Sample Search or the Title Search, make sure to select all of the criteria that fit your needs. Play around with different combinations until you find the voice or book of your dreams. What’s Cool: Recommended Search means Producers are presented with audition-ready titles that better match their voice, which helps Rights Holders get auditions from the voices best suited for their books. Producers, we now preset your default search criteria based on the attributes you enter into your profile. If you excel at business and self-help books, or prefer to work within a certain Per Finished Hour range, we’ll remember those details from your profile and set them as your default search. Less time searching means more time auditioning and producing! 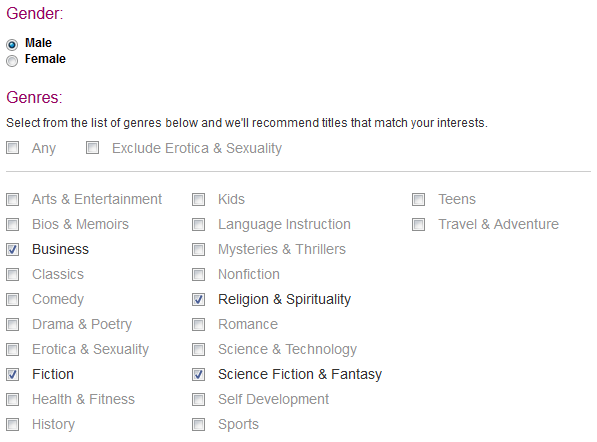 Producers who prefer to voice more family friendly fare can also choose to exclude books in the Erotica & Sexuality category from their search results. 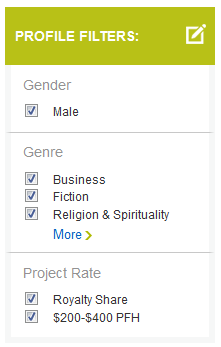 This feature is “off” by default, so you’ll need to set the filter under the “Genre” section in your profile. Look for the following section on the “Describe Your Expertise” page. This is where you’ll set your preferences. Finally, find the section pictured below on the ‘Choose Preferred payment” page. Once you save your profile information, your search will default to showing you just the titles that fall in your wheelhouse (as long as you’re logged in). 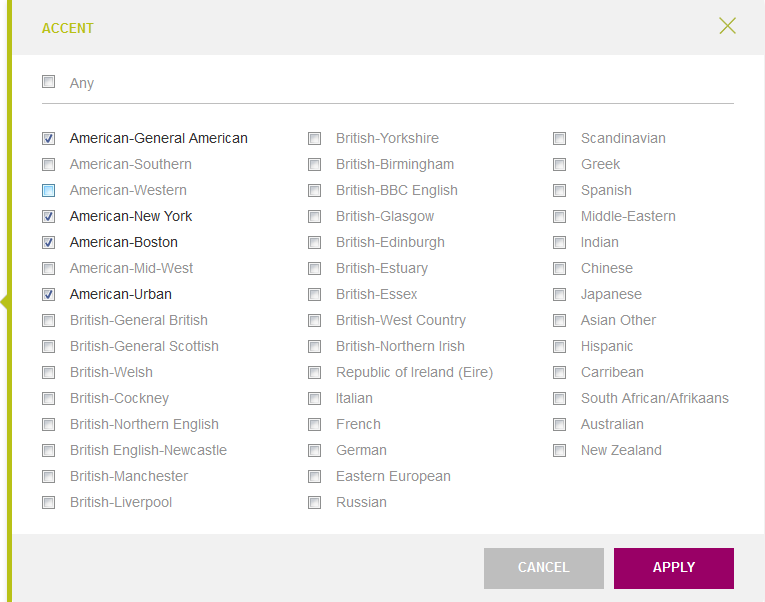 Of course, you can always uncheck those boxes to widen your search if you decide to see what else is available. Now that you’ve learned the ins and outs of the enhanced search, head over to ACX and put these new features into practice. You’ll find discovering your next audiobook project or voice easier than ever! Authors, do you think of yourselves as audiobook publishers? You should! When creating an audiobook through ACX, you cast the title, set the schedule, control the quality and promote the finished product. So, we think you can safely add “Audiobook Publisher” to your job title. Being a publisher might sound daunting. Many tasks are vying for your attention, and at the end of the day you are responsible for the quality of the finished product. 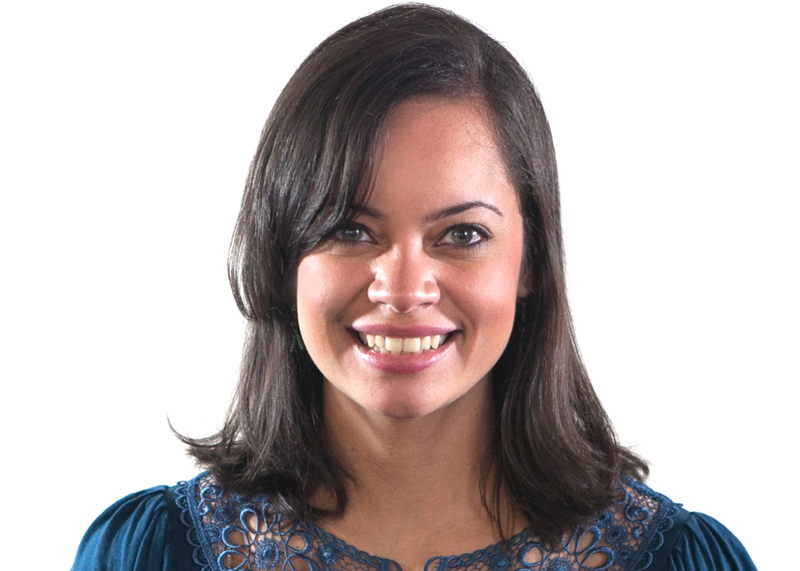 That’s why ACX Rights Evangelist Nicole joins us today to share her ACX Author’s Audiobook Checklist. Follow her the steps to ensure you stay on the path to successfully publishing your books in audio. Working with authors, publishers, and agents all day, every day, I’ve discovered that in audiobook publishing, there are optional items as well as critical items that must be checked off before proceeding from one step to the step. 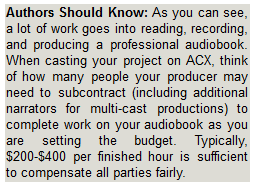 Here’s my handy check list for every step of the audiobook publishing process on ACX. Stage 1: Before You Begin Production. Confirm you have audio rights for your book by checking your print or eBook book contract. If you’re self-published (say, through Kindle Direct Publishing or CreateSpace), you’ve retained your audio rights. If you do not have audio rights, and the current rights holder has not produced an audiobook of your work, consider pursuing rights reversion like author Marta Acosta. Ensure your book is appropriate for audio. Click here for a list of books that usually do not turn into great audiobooks. Create an ACX account. You can use your existing Amazon email and password to log into ACX. It is important to fill out your name and address, bank information and tax information up front because I don’t want incomplete info to delay your payments once your audiobook is complete! Claim the best performing ASIN/version on ACX. Many rights holders have more than one version of their book (eBook, paperback, hardcover), and ACX will pull in certain metadata from your Amazon listing, such as the summary and current rankings and ratings. Potential audiobook producers will use this information when deciding if they would like to audition to narrate your book, so put your best foot forward. 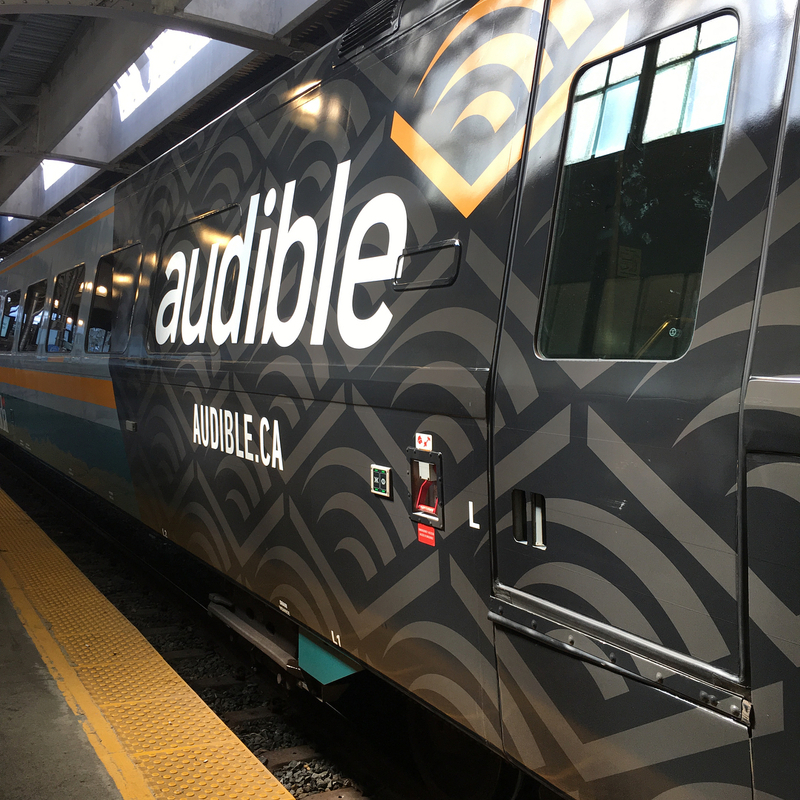 Start drafting your audiobook marketing plan. Keep your fans up to date throughout the production process to build anticipation for your audiobook. Your audiobook marketing plans can help you set due dates for your production and the time line in which you want your audiobook to go on sale. Post your book for auditions on ACX. Create the title profile for your book. Creating a robust, specific, and accurate title profile is important. A book description that’s detailed and compelling helps producers get excited about working on your project. I always tell my authors to include some performance notes (characters, accents, overall tone, etc.) and to mention if the title is part of a series. Choose the right audition script for your book. This portion should be about 2-3 pages, and should include some dialog, some descriptive text, and any important accents or character voices. Don’t worry if you can’t find all of these things in one scene – you can build an audition script that includes a few shorter passages that cover the items above. Decide the payment method for your production. 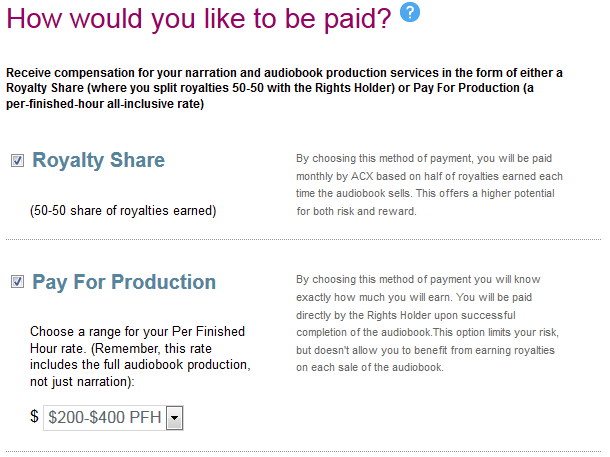 Do you want to pay your producer for their efforts upon completion of the audiobook (a fee per finished hour, as part of a Pay For Production deal) or do you prefer to split your royalties with them 50-50 (as part of a Royalty Share deal)? Learn more about payment options on ACX here. Make an offer! Clicking this button will start the process of making an agreement or deal. I recommend opening a dialogue with your narrator before or during the offer stage to ensure you are on the same page. Set a proper production schedule based on your needs and the narrator’s availability. Make sure to leave yourself time to review your final audio and communicate any corrections to your producer. Send the manuscript, and decide on a 15 minute checkpoint once your producer has accepted your offer. You can piece together the 15 minute checkpoint script from multiple parts of the book if need be. Make sure to include main characters, dialogue as well as descriptive text, any particularly tough scenes or tricky pronunciations. If any portion of the book seems likely to trip up your narrator or deserves extra attention, include it in the 15 minute checkpoint. Request clear and specific corrections to the 15 minute checkpoint as necessary. Once you approve, you narrator will have the green light to produce the rest of the book in its entirety. Secure and upload your audiobook cover. Cover art should meet our cover art requirements and should make your book attractive to potential listeners. Line up promotions. I’m constantly telling authors to think about marketing from the very beginning. Are you blogging about your upcoming audiobook? Are you alerting your fans or newsletter list that they will soon be able to hear your book? Keep whetting their appetite for audio and ensure they’ll be eagerly anticipating the day your audiobook becomes available for sale. Request clear and specific corrections to the final audio as necessary. Don’t be unreasonable, but don’t be shy. This is your audiobook, and sometimes corrections are necessary. Approve and pay for your audiobook (unless it is a Royalty Share, of course). Your title will be submitted to ACX and receive a quick quality assurance check and, if all is well, should be available for sale within 7 business days of your approval. Stage 4: Your Audiobook is on Sale! Use your codes to drive reviews and sales of your audiobook. Once your audiobook is on sale, you will receive 25 free promotional codes via email to distribute to fans and reviewers. Update your web site, blogs, and social media accounts to reflect your new audiobook. I think author Barbara Freethy’s audiobook section of her website is a great example of how to feature your audiobooks. Check your backlist, and do it all over again! The only thing better than having a book made in audio via ACX is having ALL your books made in audio via ACX!